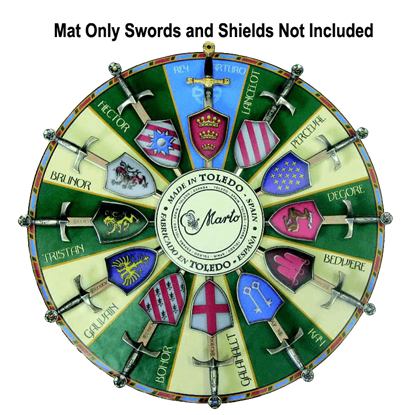 This attractive mat is designed to properly display each and every one of the Knights of the Round Table miniature swords available from Marto. The Knights of the Round Table Display mat shows each sword, along with the knights name. Perhaps the only thing more famous then king Arthur himself is his fabled sword, Excalibur. Mimicking the greatness of this legend are the Miniature King Arthur Sword and Shield, by Marto, scaled down and perfect for decoration. Representing King Arthur at his finest is, perhaps, the concept of the Knights of the Round Table, embodying equality among men. Representing the one of the kings knights is our Miniature Sir Bedivere Sword and Shield, by Marto. Representing King Arthur at his finest is, perhaps, the concept of the Knights of the Round Table, embodying equality among men. Representing the one of the kings knights is our Miniature Sir Bohor Sword and Shield, by Marto. Representing King Arthur at his finest is, perhaps, the concept of the Knights of the Round Table, embodying equality among men. Representing the one of the kings knights is our Miniature Sir Brunor Sword and Shield, by Marto. Representing King Arthur at his finest is, perhaps, the concept of the Knights of the Round Table, embodying equality among men. Representing the one of the kings knights is our Miniature Sir Degore Sword and Shield, by Marto. Representing King Arthur at his finest is, perhaps, the concept of the Knights of the Round Table, embodying equality among men. Representing the one of the kings knights is our Miniature Sir Galahad Sword and Shield, by Marto. Representing King Arthur at his finest is, perhaps, the concept of the Knights of the Round Table, embodying equality among men. Representing the one of the kings knights is our Miniature Sir Gawain Sword and Shield, by Marto. Representing King Arthur at his finest is, perhaps, the concept of the Knights of the Round Table, embodying equality among men. Representing the one of the kings knights is our Miniature Sir Hector Sword and Shield, by Marto. Representing King Arthur at his finest is, perhaps, the concept of the Knights of the Round Table, embodying equality among men. Representing the one of the kings knights is our Miniature Sir Kay Sword and Shield, by Marto. Representing King Arthur at his finest is, perhaps, the concept of the Knights of the Round Table, embodying equality among men. Representing the one of the kings knights is our Miniature Sir Lancelot Sword and Shield, by Marto. Representing King Arthur at his finest is, perhaps, the concept of the Knights of the Round Table, embodying equality among men. Representing the one of the kings knights is our Miniature Sir Percival Sword and Shield, by Marto.